Back to creative outlets for our zucchini glut. Zucchini for breakfast (or brunch)! Pancakes are an underutilized food group. They can be savory or sweet, salty or caramelized. Eggy, floury, or, in this case, loaded with zucchini. This is a great way to boost the nutritional profile of your pancake, yet still good with berries and maple syrup (grade B, of course!). In this iteration, I added some of our newly discovered wild blackberries. Permaculture zone 5 produces yet again! 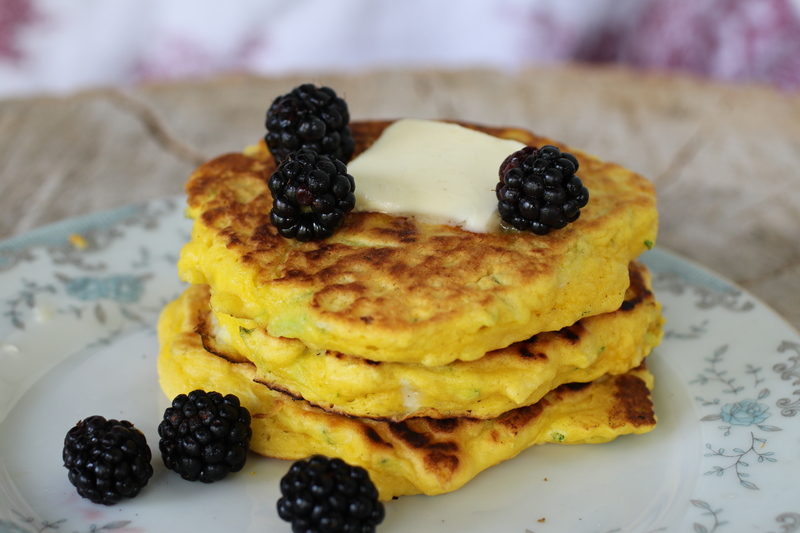 Slightly savory pancakes with zucchini, which can be dressed up with berries and maple syrup, or taken the other way with cheddar and scallions. Place a heavy plate in your oven, and set it to low or "keep warm." Beat the eggs in a large bowl. Add the olive oil and sugar, and whisk to combine. In a separate bowl, sift together the flour, baking powder, and salt. Mix in the zucchini, making sure it's well distributed. Add the egg mixture to the zucchini mixture, and mix together until well combined. It will be a considerably thicker batter than most pancakes. Allow batter to rest for about 3-5 minutes. Meanwhile, place a griddle (preferably cast iron) over medium heat. Add a swirl of olive oil to the griddle, and allow to heat but not smoke. Drop batter from a 1/3 C measuring cup onto the griddle. You may need to flatten out a bit with your spatula to get them sufficiently thin. Cook the pancakes about 2 minutes (check after about 90 seconds) before flipping. They'll be ready shortly before bubbles stop coming to the surface, but the border between perfect and toast is fairly narrow. Flip and cook another couple of minutes until done. Move to the oven to keep warm while you cook the rest of the pancakes. Serve with butter, maple syrup, and fresh berries (blueberries, blackberries, and sometimes fall-bearing raspberries overlap zucchini season well), or go the savory route and use cheddar and scallions.